Sending out a big thank you to The Makeup Show and to all those who attended to make this such a successful event. 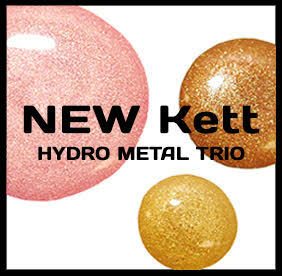 We’d also like to thank everyone who stopped by the Kett Cosmetics booth to say hello and share the excitement for our newest product launch- the Hydro Metal Trio. With the metallics trend in full swing, this Limited Edition set of Rose Gold, Bronze and Gold Rush offers the perfect combination of metals to use alone or together, with or without an airbrush, in a range that compliments all skin tones. Being a New York brand, there was no question that this was the place to debut this collection! Other exciting news from the show is that our very own Sheila McKenna gave a stellar presentation on color theory, where she demonstrated mixing skin tones for three different models. By using only the Kett Hydro Color Theory Collection, it was a great “brush up” on custom color blending, as well as a reminder of the limitless possibilities of a kit stocked with products designed specifically for professional makeup artists. At The Makeup Show NYC, we got to meet so many artists and exchange ideas, knowledge and inspiration. Looking forward to more of the same at The Makeup Show Chicago. See you there!